Does This Video Really Show A Dog Grieving Over His Lost Friend? There's no better testament to animals' capacity for emotion than this: one dog, standing over the body of his companion, trying to wake the animal before he's buried. But what's actually going on here? Is the dog really mourning his friend? Anecdotes of dogs allegedly mourning are not completely unheard of. After a photograph of a K-9 dog sitting by the coffin of his slain police officer went viral last year, commenters assumed that the animal was experiencing a form of grief. It's difficult to know what's going on inside an animal's mind (and there is always the risk of projecting human emotions onto animals), but there is some evidence that dogs may experience something akin to sadness after loss. One ASPCA study found that two thirds of dogs show distinct signs of grieving after loss, like decrease in appetite, lethargy and clinginess. And there are anecdotal accounts of dogs waiting at their owners' graves or even wailing, as Brian Palmer over at Slate pointed out. But in this video's case, the word "grief" may not be the precise one. "This absolutely looks like the dog trying to ‘wake up' or get the attention of his friend," Dr. Alexandra Horowitz, professor of psychology at Barnard College and an expert in canine cognition, told The Dodo. "This doesn't look like grief at all, just confusion. 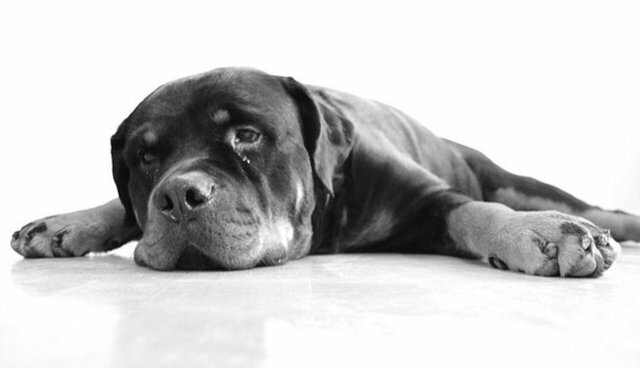 Do dogs grieve? It's hard to prove, but it's not hard to believe."